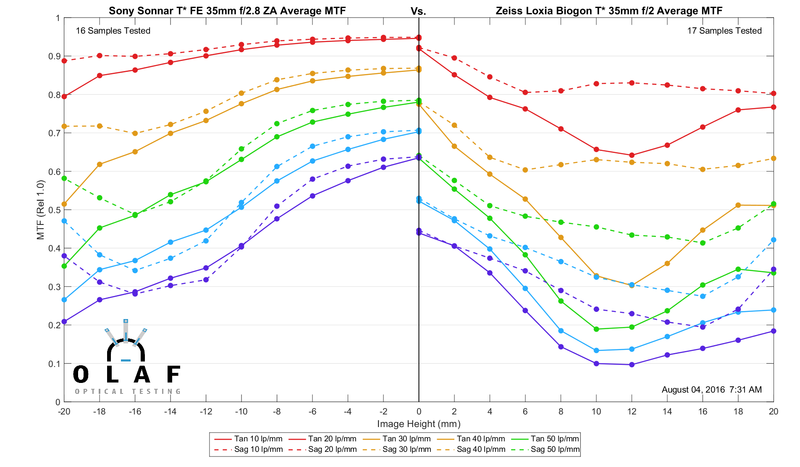 For quite a while now, some you have asked where the MTF results were for the Zeiss Batis and Loxia lenses, and my answer has been not done yet. There were a lot of reasons for that. Chief among these was the lenses are so popular that we can’t get as many as we want and keep them in stock long enough test them. There were also the issues we had modifying our optical bench for testing lenses with an electromagnetic focus for the Batis lenses. So this arrives pretty late, way after most of you have made whatever purchasing decisions you are going to make regarding these lenses. But better late than never. 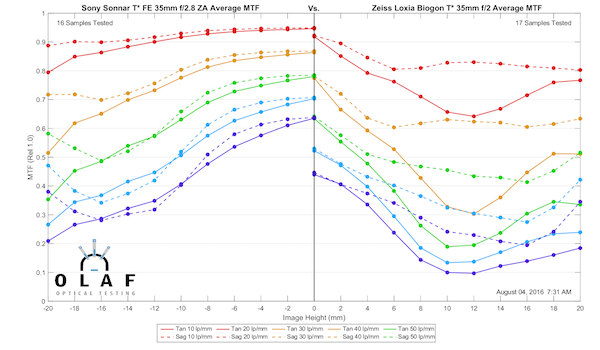 With that in mind, though, I’m going to post all of our Batis and Loxia results in one place (here) just like we did in summarizing the Sony FE lenses so that it can serve as a reference. One thing I will mention, because I think it acts as a good example. 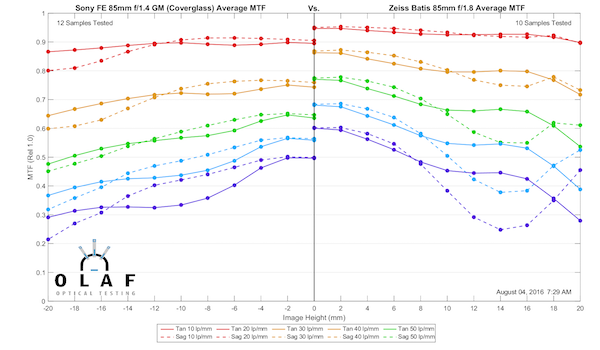 Unlike most manufacturers, Zeiss publishes measured MTF curves with their lenses, not computer simulations. When you ask me why my results are different from ones released by Canon or Nikon, I quickly say mine are real; theirs are idealized computer simulations. When you ask me why my results are different from Zeiss’ results, the answer is that they are different measurement techniques. Some will have to do with various machines; Zeiss uses their K-8 and K-9 machines, we use a Trioptics Imagemaster vertical MTF bench. The light source is slightly different, for example. The Imagemaster uses a photopic light; Zeiss uses (I believe) a broader spectrum source. It may also have to do with the number of points measured, the number of samples tested, and a host of other things. For example, we measure each lens at four different rotations, taking cuts from side-to-side, top-to-bottom, and from each diagonal, so each lens is measured at 84 points. The main reason we measure this way is that we’ve written software to give us an easy way to compare lenses to see how they differ. That may be a very different measuring technique from what Zeiss uses. Other differences are going to be our mount, which cuts the 20mm edges in some measurements, or the thickness of sensor glass utilized in the test. (I can only obtain optical glass in 1,2,3 or 4mm thicknesses, and the sensor glass is between 2.3 and 2.5mm thick.) This may make a slight difference, and more importantly, the amount of difference varies somewhat depending on the lens in question. So why bother to publish this data instead of just letting you look at Zeiss’s data? Because Zeiss doesn’t test the other lens brands. If you want to compare MTF between, say, a Loxia and a Sony FE, then these are worthwhile. Markus has written an excellent new piece of software that lets me put up side-by-side comparisons just by pushing some buttons. Since I want to play with my new toy, I’m putting each Zeiss lens MTF next to a Sony lens of similar focal length. Remember, though, that they are all measured wide open, so don’t look silly and say this f/2.8 lens is sharper than this f/1.4 lens. Because aperture. 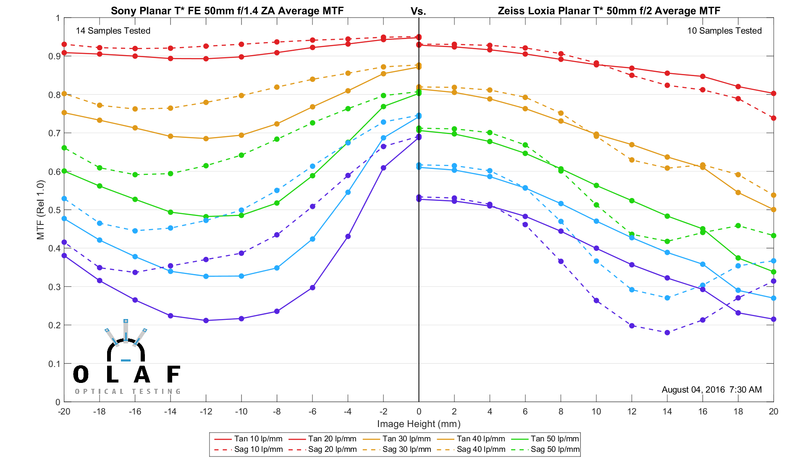 And, of course, if you want to compare these to other FE mount lenses, the MTF charts are here. The closest comparison I came up with is the Sony FE 28mm f/2.0. It’s a fair comparison since they’re both f/2.0, although the Sony lens is far less expensive. The Sony does pretty well from a resolution standpoint in the center where it’s as good or perhaps a tiny bit better than the Batis, but away from the center, the Batis shines, maintaining its sharpness well and with little astigmatism. I chose the Sony 35mm f/2.8 ZA Sonnar as the comparison lens, so remember, of course, that it is being tested at a stop’s smaller aperture. The Loxia would improve stopped down to f/2.8. Even given its disadvantage, though, it’s apparent the Loxia 35 isn’t the fastest horse in Zeiss’s FE mount fleet. It’s an older design so we shouldn’t be too surprised at that. 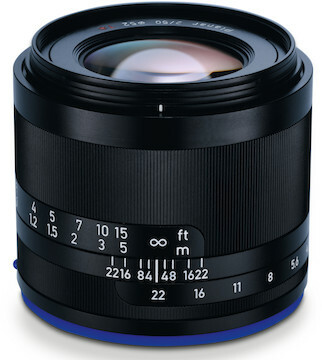 And yes, I know you’re all curious as to how much better the Loxia would be at f/2.8. So am I but time takes time, and I don’t have any right now. In this test, I gave the Loxia a full stop advantage by choosing the new Sony 50mm f/1.4 ZA as it’s comparison. On the other hand, the Loxia is considerably less expensive. Despite giving up that stop of aperture, the Sony ZA clearly has higher resolution. 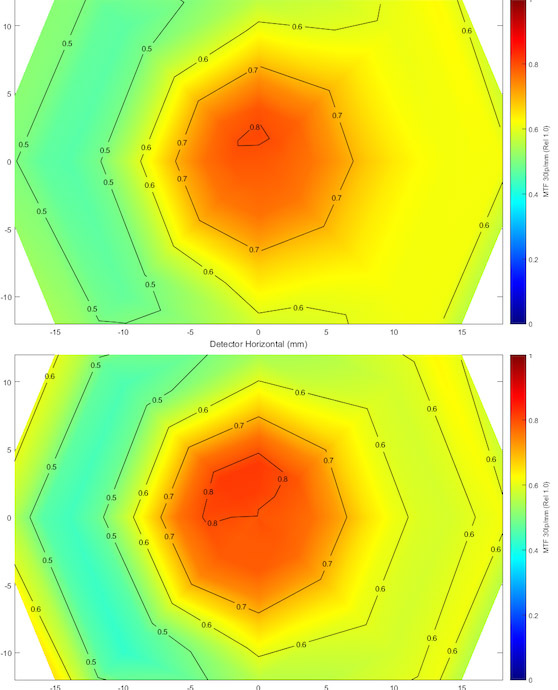 However, the smooth, fairly astigmatism-free MTF curves of the Loxia suggest it will have a very different ‘look’ that some people will prefer. The comparison here is with the Sony 85mm f/1.4 GM lens, which is more expensive, but gives up some aperture. Even considering the aperture difference, the 85mm Batis puts in a most impressive performance. Excellent resolution and very flat curves across the field. It’s not an inexpensive lens, by any means, but its performance is most impressive. I haven’t gone into great detail about this set of lenses for one fairly obvious reason: they’ve been out quite a while and photographers who love them love the look of them and don’t seem anxious about what the MTF is like. I think this does show, to some extent, why the Loxia Biogon 35mm f/2.0 isn’t as popular as the other lenses, perhaps, but that’s about the most significant thing I see here. I know some of you are asking where the results for the 21mm and 18mm Batis are, and the answer is ‘not done yet.’ I’ve made a solemn oath not to post data like this until we’ve finished ten copy sets, and those are still so popular that we haven’t finished testing yet, we can’t keep them in stock long enough. Stay thirsty, my friends (and patient). Roger – Thanks for the info. Sorry for the all caps, but YOU NEED TO CORRECT THE TITLE AND OTHER REFERENCES TO THE BATIS. YOU KEEP CALLING IT THE 25/2.8 WHEN IT IS THE 25/2. Thanks. How is the sample variation of the Batis 85mm? Was the diagram published somewhere? I would dearly love to see a comparison with the new loxia 25, particularly against milvus 25 @2.4 and batis 25 @2.4. Will this happen? Probably not – you have your own testing methedology. Still, whenever you get around to the new loxia 25 I’m excited to see what you discover. turns out I was prescient! More or less. I guess , with it being an affordable alternative, many people probably would just buy it outright rather than want to rent. I suspect there will be some more alternatives from Sigma and Canon in the near future so would be nice to log the Tamron’s performance. p.s. Don’t worry about sending me digging through all those old blog posts. In all honesty you’ve earned so much respect from me over the years that it is easy to forgive a tiny slip like that. Omesh, I apologize. I was thinking of the 35mm. We don’t have enough of the 85s to do a full test. Hi Roger, I went through the blog all the way back to Feb and couldn’t find it. I only found 35/1.8 and 45/1.8 VC tests, not the 85/1.8 VC test. Was the 85mm bundled together with another lens test or does it have an obscure title? This blog site might just be the most awesome thing I’ve ever found on the internet. I’m dead serious. I agree. Using it from f 4 on and at 5.6 to 11 most of the time. The Zeiss 35/2 has a lot of aberrations at f2, improving significantly at f2.8, so I wouldn’t make conclusions based on only performance wide open. Stopped down, it’s a sharp lens with many nice imaging properties. My experience from using the Batis 85 has been that it’s clearly better in most regards than its CaNikon equivalents. Your MTF measurement indicates that measurements might agree. Looking forward to copy variation data. I’ve had challenges getting good performing copies that are not decentered. Wondering if I just have bad luck, or it’s a common issue. Omesh, we tested it a while back if you want to google for it. I know searching through our table of contents is pretty worthless. How does the Tamron SP 85mm f/1.8 VC do? will fe28/2 performs great on a6000? Daniel, they are wrong – pulled in from a different graph. We’ve corrected the software but I’m out of town so it will be a week or so before I can get around to posting new graphs with the correct legend. Neat. Very curious about the Loxia 35. Thank you guys for all your work on these many hundreds of lenses you’ve tested and presented to us. I know you say they are tested wide open and so it would be silly to compare, but then you go and place them mirror-wise alongside and that just invites comparison. Surely the correct thing to do would be to say “Sorry folks, I’m not going to stick that next to the other, because that wouldn’t be a responsible way to present the data”. Some of these lenses will be used wide-open, but most won’t. Many will be used a stop or so closed down. Some will be used heavily closed down for DoF. So I’m wondering if this wide-open testing is as problematic as your concerns about IMATest charts being used only so many feet away, rather than at infinity. Is there any way you can test these at f/2.8? That would at least give a level playing field for most primes, and for some of the pro zooms. And testing a few at f/5.6 or f/8 might be interesting wrt what real gains spending more $$$ really buys you at those apertures. It seems perverse that people use f/1.4 to render much of the image as an out-of-focus blur and yet that is the aperture being assessed for sharpness. And the portrait photography that most needs such wide apertures is also the style most likely to be forgiving of having soft corners. Oh man for a second I thought the 28/2 was the most bizarre lens ever until I noticed you’d flipped that chart so that it was “back to back” with the 25/2 chart! Now that I know about it haha I like that presentation very easy to read. 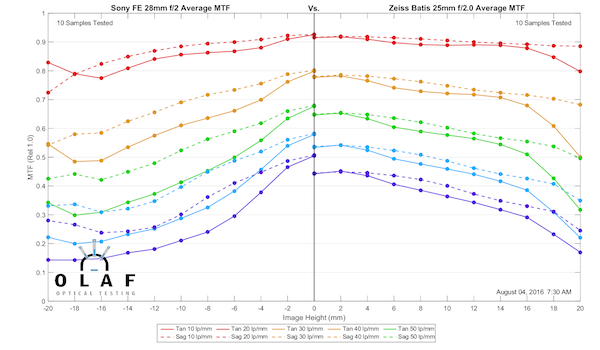 Considering the testing differences, the parallels to Zeiss’ own MTF’s are clear. There are no surprises here. Thanks for the effort and thanks for posting the Sony 28mm’s results!